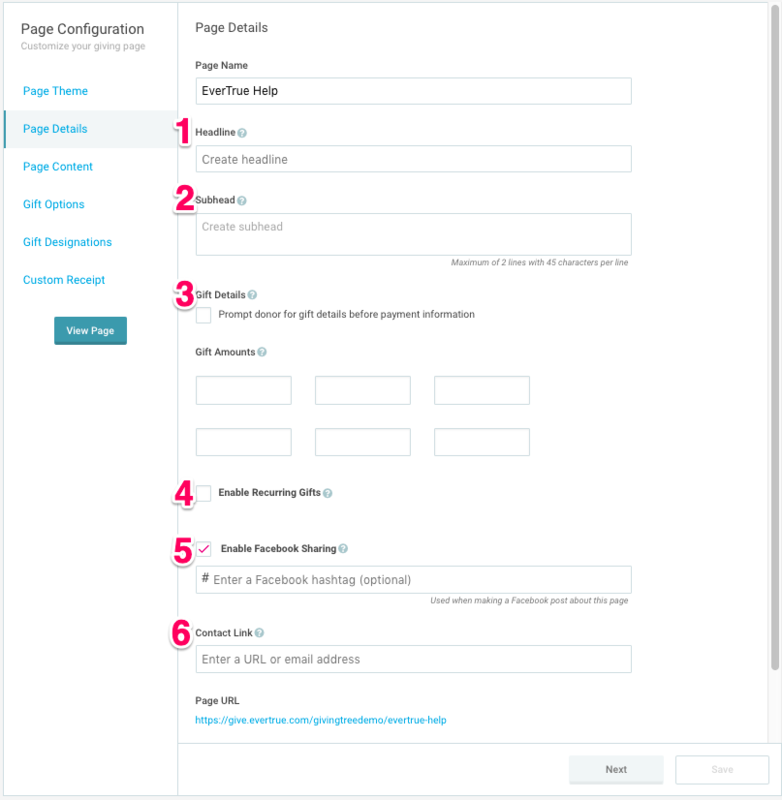 With our latest release, the Giving Pages creation workflow has gotten a facelift. Take a look! Once your Stripe account is connected, you can create your first giving page! Head to Giving Pages in the left-side menu and select New Give Page to begin. 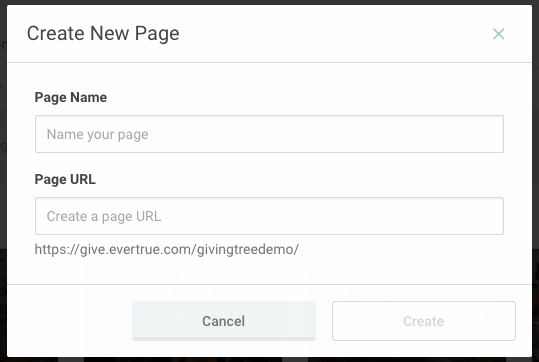 If you've already created at least one giving page and want to create another, go to the Actions drop-down menu in the upper right side and select Create New Page. Page Name: First name your page. This name will only be visible to admins/owners and becomes the name that an administrator can search for, select when creating an appeal, and filter on in reporting and analytics. Page URL: The page URL is auto-generated in the following format when you type in a page name: https://give.evertrue.com/[orgname]/Page. However, you can adjust the "Page" portion of the URL if you'd like it to be different than the page name. Once the URL has been established, it cannot be adjusted. It's easy to make the giving page your own. 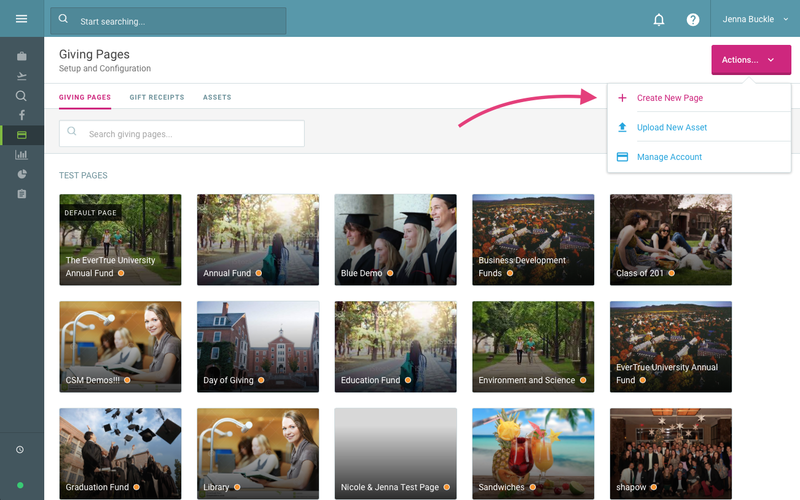 Under the Page Theme tab, customize your new page to reflect your institution's brand or to support a special campaign by adding a header image, background image, logo, color scheme, and more. For images, you can choose to upload a new file or select an item from your current Asset Library. 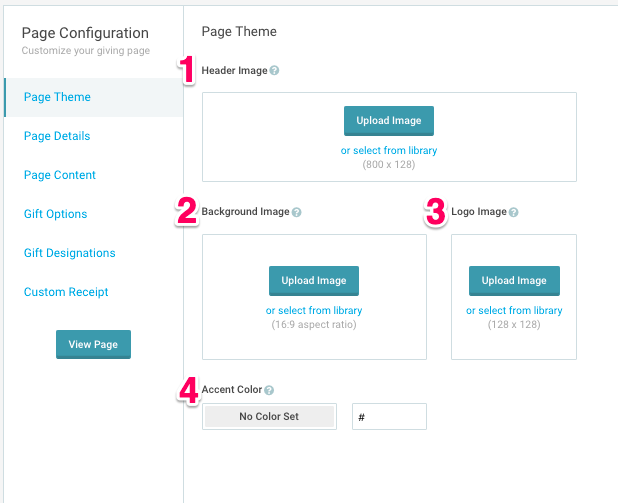 Header Image*: Add a header to your giving page, which appears across the top of the page. If enabled, this replaces the logo in the top left corner of the donation page in favor of a full header. Background Image*: Add more flair to your page by uploading a custom background image. Logo Image*: Your logo will appear during the Stripe checkout process at the top of the checkout form. Accent Color: This is the color of important areas on your giving page, most notably the "Give by Credit Card" button and the suggested amount buttons. You can either select from the color widget or use a hex color code. *You have the option of uploading a new image or selecting from a library of previously uploaded images. Click the question mark icons for suggested image specifications. Our supported file types are JPG, JPEG, BMP, or PNG. Recommended design dimensions can also be found here. Next, head to the Page Details tab to customize additional aspects of your new giving page. Headline This is the large text that appears at the top left of your online giving page. Subhead: Use this field to add additional information or text to your giving page. This will display under the headline. Gift Amounts: You can set custom gift amounts for each giving page. There is a maximum of six fields available, and you're free to use all or none of them (or anywhere in between). For example, if you only want to provide donors with three suggested gift amounts, you can! 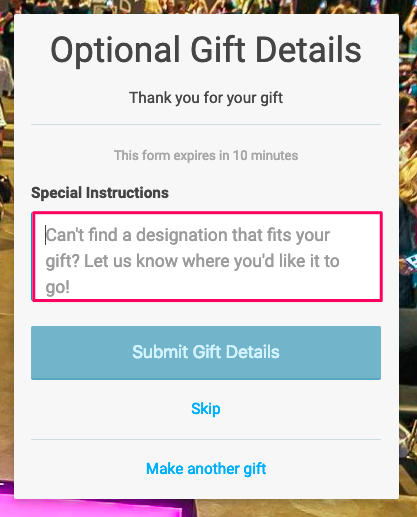 Leave the fields blank if you don't want to suggest a gift amount or would rather have users enter their own. This will remove any suggested gift amount buttons from the donation page, showing only a free, open "Amount" field where the donor inputs his or her donation amount. You can ask donors for gift details prior to entering their payment information by selecting the checkbox below Gift Details. Enable Recurring Gifts Checking Enable Recurring Gifts lets donors easily opt-in to recurring monthly gifts. These gifts will be charged every subsequent month on the same day of the month that their first gift was given. For example, if a donor gives on December 15, the next charge will be on January 15. Currently, recurring gifts are only on a monthly cadence and do not include the ability to set an end date. Similar to the Gift Amounts above, once you have enabled the recurring gift option, you will be able to set suggested gift amounts for those recurring gifts. Enable Facebook Sharing This lets your donors share your giving page on Facebook via a link at the bottom of the page and after they've made a donation. You have the option of adding a hashtag, which will auto-populate in the Facebook sharing link. Contact Link: Enter a URL or email address so your donors can contact you with any questions. This link or email address will appear in the “Contact [org name]” hyperlink at the bottom of your giving page. If you're using an email address in this field, make sure to include "mailto:" just before the email address. Follow this format: mailto:genius@evertrue.com. Remember, you can always go back and edit or adjust these fields as needed. So don't panic if you don't get it right the first time. You can make adjustments later. 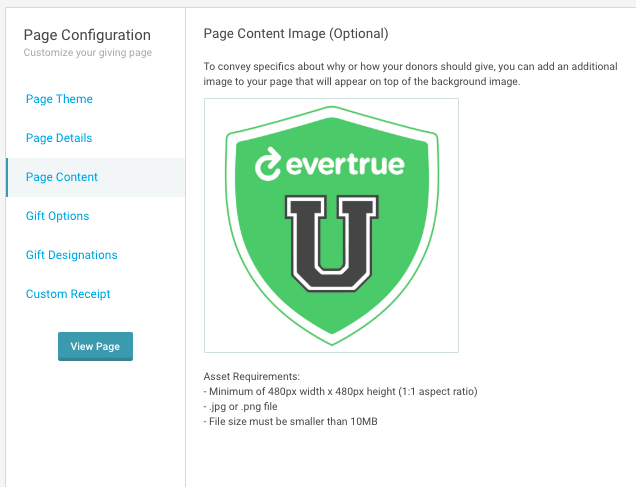 The Page Content tab gives you the option to add an additional image to your giving page. Your page content image will appear on top of the background image. 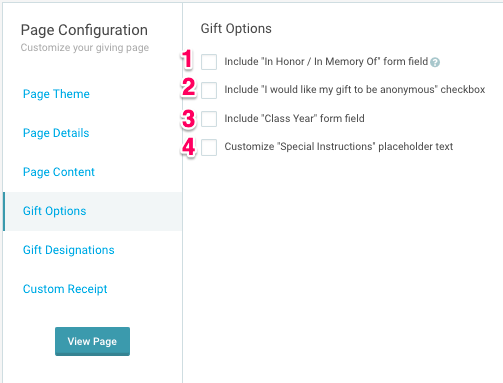 Include "In Honor / In Memory of" form field: allow your donors to specify an honoree for their gift. Include "I would like my gift to be anonymous" checkbox. Include "Class Year" form field. Customize "Special Instructions" placeholder text: Change "Special Instructions" text that appears to a donor, in the Special Instructions text box. In Gift Designations, you'll have the option to Include "In Honor / In Memory Of" as a field during the donation process. When you check this box, you enable an additional text field for your donors to enter additional information about their gift after the transaction is complete. 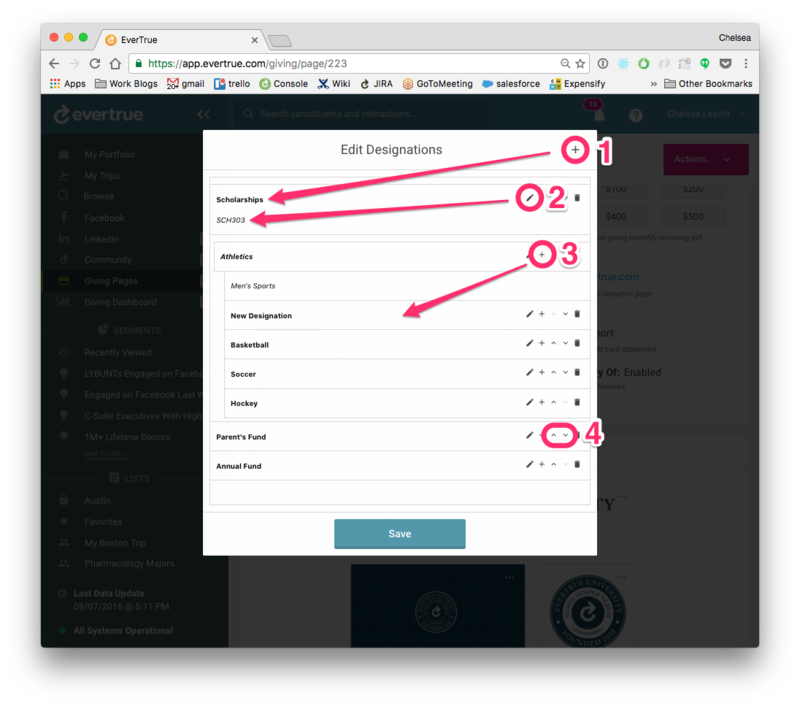 If your organization would like to setup designations for a giving page, feel free to add those now or reach out to EverTrue Support for assistance at genius@evertrue.com! If you enable designations for a specific page, donors will have the option of selecting gift designations after they complete the transaction. To begin, click Add New Designation and follow the directions below. Click the “+” button in the top right corner. This adds a text field where you can enter a New Designation. Click the pencil icon on a designation to add an optional code that matches a fund number in your database. This makes reporting and reconciliation a snap! When gifts are exported from EverTrue, this designation code will be included. You can also create subgroups of designations. In the example above, we have one large bucket ("Athletics") that contains several gift options (in this example: "Basketball," "Soccer," and "Hockey"). Do this by clicking the “+” icon at the designation level. Note: You can still add fund numbers for reporting purposes to each of these subgroup designations by clicking the pencil icon. Use the up and down arrows to rearrange the order of your designations. You can use the trash icon to delete a specific designation. Remember to click the Save button and preview your designations in Test Mode before going live so you can make any necessary adjustments. The last section is Custom Receipts - for a full overview of how to create a Custom Receipt, check out this article. 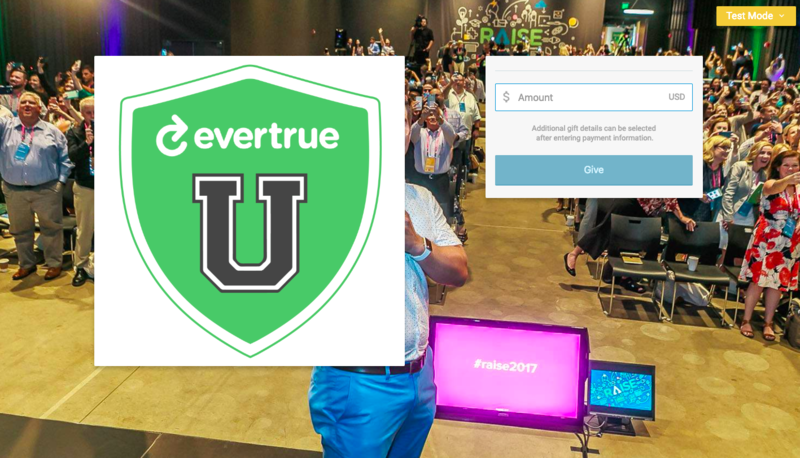 Once you've selected your custom receipt (or the default EverTrue Receipt), you're all set! Now it is time to go live! By default, pages are set to Test Mode until the Admin decides to “Set the Page to Live Mode. For more information on testing out your page and setting it to Live, click here!